She's fled war, endured neglect and survived abuse. Now, at 17, she's one of Skowhegan's most admired residents. SKOWHEGAN — If you don’t kill the lion, the lion will kill you. 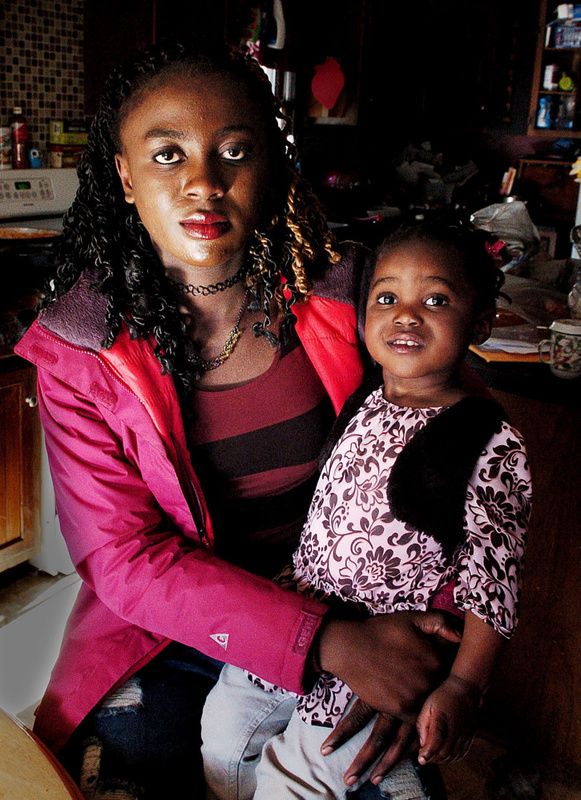 The lion was real for Aziza Perkins, 17, a refugee from the Democratic Republic of Congo, in Central Africa, and now living in Maine. The lion is also a metaphor. She killed the real lion with an African bow and arrow device called a flash while fetching water with other girls from her village of Mokali near the capital city, Kinshasa. The metaphorical lion was the continuing war in Perkins’ homeland, in which her grandfather and her father were shot to death. The lion also was life in a tin shack without windows, becoming a refugee at age 13, being put in foster care after abuse in her biological family, and becoming a mother at age 15. Now a junior at Skowhegan Area High School, Perkins and her 2-year-old daughter, Tiana, were adopted formally in April and live with her new mother, Michele Perkins, in Norridgewock. Life is good and the lion is dead. Perkins was 11 at the time. Perkins recently was the recipient of the Julia Clukey Courage Award, presented to her at the high school by Clukey, an Olympic athlete in luge competition and a native of Augusta. The award, which Clukey gives to students at schools she visits, focuses on encouraging young people to find their passion, create a plan and pursue their dreams in spite of adversity. Clukey, 31, is a survivor of Arnold-Chiari malformation, a brain disorder involving structural defects. Clukey also is the 2012 national champion in luge and is training for the 2018 Winter Olympics, which will be held in Pyeongchang, South Korea. She presented the award to Perkins in a March 31 ceremony at the school. Perkins, a refugee from the Democratic Republic of Congo, and her daughter, Tiana, now live with their adoptive family in Norridgewock. Skowhegan Area High School Principal Monique Poulin said the school’s Student Council members anonymously nominated students who they felt had demonstrated an ability to overcome adversity or challenge, Poulin said. The names then were passed along to the school faculty, which voted on the award recipient. Clukey said in an interview that she began speaking at schools in Maine six years ago but only recently started giving out the courage awards. There have been six recipients so far, including Perkins, and Clukey said she still has 16 more schools to visit this year. Perkins arrived in the United States in February 2012 as a refugee from Congo, not speaking a word of English. She and four siblings and her biological mother first lived in North Carolina, but they fled the state when local authorities moved to take Aziza and her siblings because of neglect. They arrived in Portland later the same year. Within a week, state Department of Health and Human Services workers took the children. Caseworkers allowed them to reunite in 2013 in Lewiston. She went in November 2013 to Michele Perkins’ home in Norridgewock, through placement by DHHS, to live with Perkins’ and her family. Four of Perkins’ six children are adopted. Aziza’s daughter, Tiana, was born on Jan. 5, 2014. Michele Perkins, 50, is a licensed foster parent and an adult case manager at Reach Family Services. Aziza Perkins remained in foster care for 876 days before being formally adopted by Michele Perkins on April 20. Julia Clukey, left, Aziza Perkins and Rep. Jeff McCabe, D-Skowhegan, show off Perkins’ Julia Clukey Courage Award. 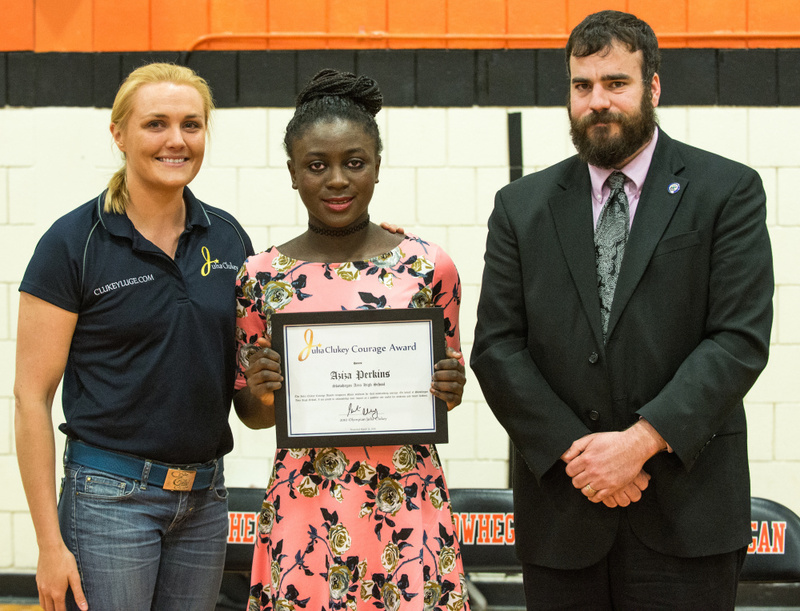 The Skowhegan Area High School senior received the award March 31. The war in Congo has claimed up to 6 million lives, either as a direct result of fighting or because of disease and malnutrition. While Aziza Perkins talked comfortably about all that has happened to her in her young life, the memories and the trauma are not far from the surface. 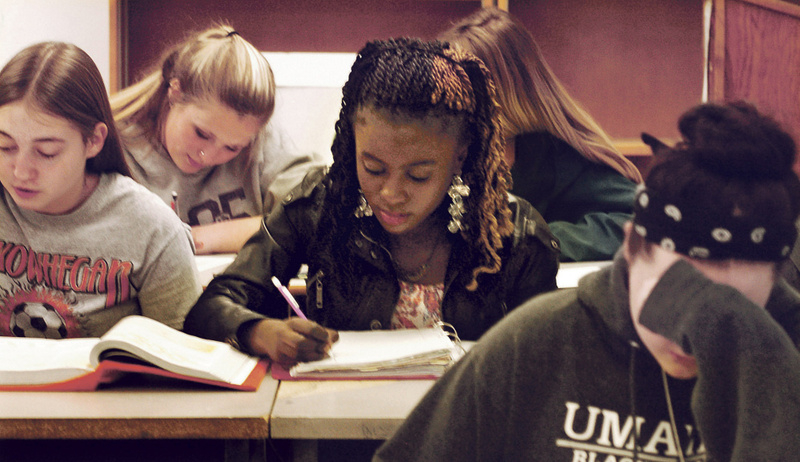 She said it took courage to leave Congo to come to United States; it took courage to learn English and to come to Maine, where the winters can be severe; and it took courage to fight to stay in Maine and to keep her child at age 15. When she found out she was the award winner, she cried. “I think I was chosen for the award because I’ve been through a lot in Congo, like seeing all the people killed – a gun going to my head – not eating anything through the day, going to the river two miles to get water and wash clothes,” she said. Michele Perkins, whose husband died several years ago in a plane crash, agreed, saying Aziza Perkins has experienced much in her young life. “I think it’s a huge honor and it’s well deserved, having gone through everything she’s gone through and still be a very successful mother,” she said. Aziza Perkins said she wants to go to college after high school to study international business and psychology. “When I graduate, I want to have a job,” she said. “I want to travel and go help people in Africa. CORRECTION: This story was updated at 12:03 p.m. on May 9, 2016 to correct factual information about Aziza Perkins’ background.